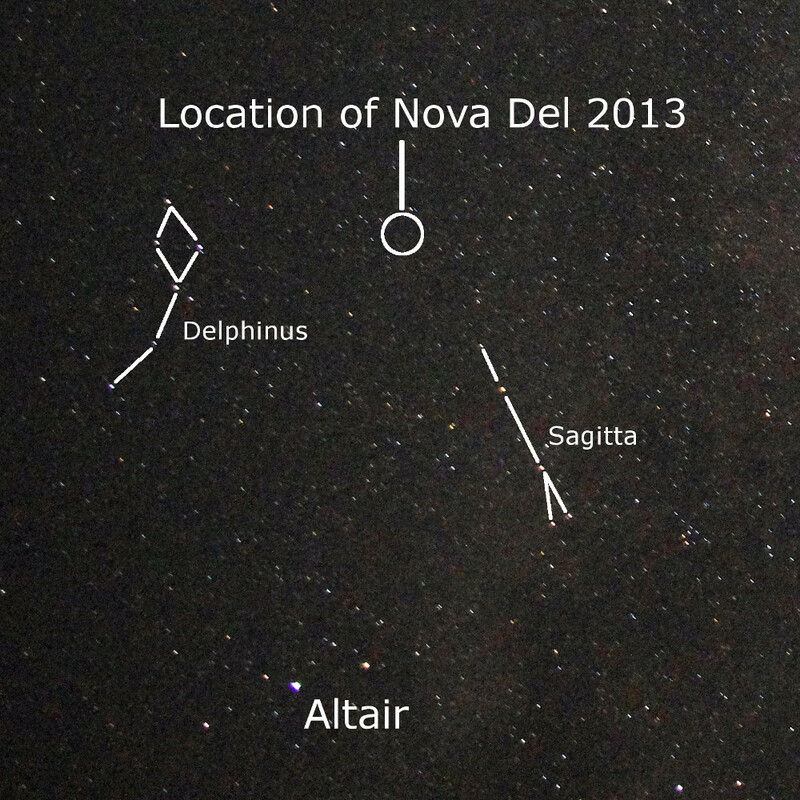 For those interested in nova explosions, 2013 was a great year as two novae were discovered that became visible to the naked eye – V339 Delphini and V1369 Centauri. There’s a summary of what novae are at the bottom of this post. [These novae are named by the constellation in which they appear – here Delphinus the Dolphin and Centaurus the Centaur – together with a catalogue number and the letter V for variable star]. Although I’ve carried out research into novae for almost thirty years (ouch), I’ve only ever seen one with my own eyes without the aid of a telescope. This was nova V1494 Aquilae which I spotted in 1999 from the Kerridge Ridge above Macclesfield. 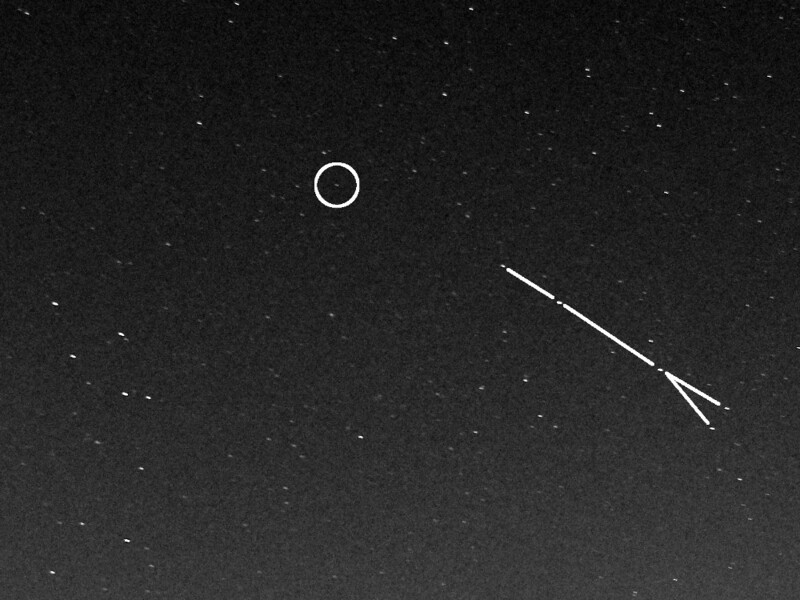 It’s quite unusual for a nova to get so bright and even for those that do, they are often only bright enough for a few days before they fade away and you need to get out your telescope. As it turns out when the explosion of V339 Del was spotted on August 14th 2013, I was in an ideal place to see it before it faded – on holiday on a Greek Island with beautiful clear skies. But I didn’t have an internet connection and had no idea it had even exploded. Even more frustratingly, just a few days before it exploded I’d been sitting by the pool at night taking some photos of the sky hoping to catch some Perseid meteors (as you do). So I have some lovely photos showing the Milky Way, a Perseid and the constellation of Delphinus (the Dolphin). Sadly the latter photos just prove that two days before the discovery was announced there was no new star at the position of V339 Del. When I returned to Manchester, the nova had faded below naked eye visibility but was still bright enough to see in photos taken with my SLR from the back garden in South Manchester (even through the light pollution). Leaving aside the fun of spotting novae with the naked eye, on the research front V339 Del has of course attracted a lot of interest. The nova-cv group has been monitoring it with the Swift spacecraft, following the transition from X-ray emission from shocked gas in the ejected material, to the emergence of brighter X-rays from the hot white dwarf remnant. The nova was also detected in gamma-rays by the Fermi spacecraft and the radio nova group has been monitoring it using the Karl Jansky Very Large Array in New Mexico. If and when it becomes sufficiently bright we intend to image it with the e-MERLIN radio telescope operated from Jodrell Bank in an effort to measure the size and shape of the ejected shell. The second bright nova of 2013 was V1369 Centauri discovered on December 2nd. Unfortunately for those of us northern types, this lies at a declination of -59 degrees. This means that it passes overhead for observers at latitudes of 59 degrees south. For me at 53 degrees north, only objects with declinations greater than -37 degrees (-37=53-90) get above the southern horizon. So sadly V1369 Cen is not visible from up here (you’d have to live at a latitude south of 31 degrees N to have any chance of spotting it, the farther south, the better of course). It’s looking lovely and pink in these recent shots by Rolf Wahl Olsen. Like V339 Del, V1369 Cen has also been causing quite a buzz amongst researchers. It too was detected as a gamma-ray source by the Fermi spacecraft. It’s now looking very much like all novae are gamma-ray sources and we just needed a good enough telescope to spot them. One of the favoured options is that the gamma-rays come from shocked gas. The shocks probably arise from variations in the speed of the ejecta so that faster gas catches up and runs into slower gas, or from the ejecta slamming into previously existing matter around the nova (e.g. from the wind of the companion star). This is a higher-energy manifestation of the same phenomenon that produces some of the X-ray emission seen with the Swift spacecraft in other novae, V339 Del for example. Although it’s too far south to be observed with the VLA or e-MERLIN, in December it was detected in the radio with the Australia Telescope Compact Array. We expect this radio emission to brighten as the ejected shell expands. Although we have a fair idea of what novae are and the basic parameters of how they work there are many unanswered questions. For example, “Do some novae eventually explode as Type Ia supernovae?”, “Do novae eject jets?”, “What causes the gamma-ray emission?”, “Why do the X-rays show quasi-periodic oscillations?”, and “How much mass does a nova eject?”. Nova comes from “Stella Nova” – New Star. Every now and again a new star appears in the night sky. Originally thought to be new stars being born, we now know these mark cataclysmic explosions associated with stars near or at the end of their lives. There are several types of nova. Classical novae are explosions on the surface of white dwarf stars in binary stars systems. White dwarfs are the dead cores of lower-mass stars like the Sun. They are exposed after the star evolves beyond the red giant stage and its outer layers are lost to form a planetary nebula. If the white dwarf is in a binary, gas can fall from the companion star onto its surface. Imagine a white dwarf about the size of the Earth but weighing about as much as the Sun. It is in close orbit around its companion star, so close that the orbit would fit within the size of our Sun. The gas builds up on the white dwarf until the pressure reaches a critical point at which nuclear fusion begins at the base of the accreted layer. This results in a thermonuclear explosion expelling something like an Earth’s mass of gas into space at speeds of hundreds to thousands of kilometres per second. It brightens by a factor of 10,000 or so leading to the appearance of a stella nova. Recurrent novae are simply classical novae which have been seen to outburst more than once. We actually think that all classical novae recur. The white dwarf is not destroyed in the outburst so the accretion process can soon begin again and another explosion can take place sometime later. For many novae this will not be for thousands of years so only one outburst is known. But in some cases the recurrence period can be much shorter (probably when the white dwarf is massive and the critical pressure is reached sooner). The shortest known is U Sco which explodes every 10 years or so, although recently a nova in the Andromeda Galaxy was discovered which appears to have outbursts every year or so. Dwarf nova outbursts also take place in binary systems including a white dwarf. But here the brightening is not as extreme and appears to come from a sudden increase in the rate at which the gas is transferred onto the white dwarf through an accretion disc. Supernovae, as the name suggests, are much brighter than the normal classical novae. There are several types. Type II supernovae are the explosions of massive stars (more than about eight times the mass of our Sun). The core runs out of nuclear fuel and collapses to a neutron star (or possibly a black hole for the most massive stars) whilst the remainder of the star is thrown off into space. This distributes into space the heavy elements created by nuclear fusion in the star and in the explosion, forming the raw materials for new generations of stars and planets. In contrast, Type Ia supernovae are thought to be the explosions of white dwarf stars which exceed their maximum mass of 1.4 solar masses (known as the Chandrasekhar mass) either by accreting matter from a companion star or by the merger of two white dwarfs. We think there may be as many as 30-40 classical novae each year in the Milky Way but only around 10 of these are detected. Supernovae are much rarer with a galaxy like the Milky Way seeing one such explosion perhaps every 30-50 years or so. Again not all are detected. The last supernova in the Milky Way indisputably seen by observers was Kepler’s Supernova in 1604, although Cassiopeia A appears to be a remnant of a supernova which took place in about 1680 remnants and a recently discovered X-ray source G1.9+0.3 seems to be the remnant of a supernova dating from about 1870. Greets- I find it extremely frustrating that out of about 10 sites about Delphinus and the V339 Delphini nova not one mentions the distance to the nova. Nobody knows? Is there some reason it can’t be determined? Exasperating.